Inka and pre-Inka wisdom. 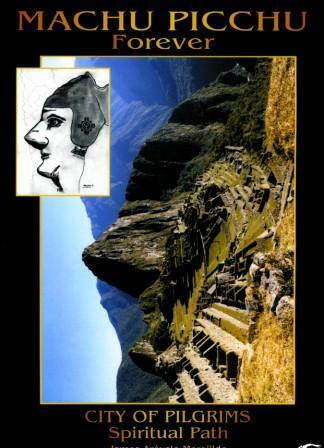 Mallku shares his discoveries and amazing esoteric teachings about the secrets of the Andes. literature is only a guideline for spiritual development since it will be through direct personal experience that each individual of good will has the opportunity to experience his own spiritual growth. To help others achieve this, whenever possible we offer journeys throughout this sacred land of the Andes, always invoking “Pachamama” as the Being of Substance and “Wiraqocha” as the Being of Illumination and the guide along our way. *Our plans do not stop there; we are working to build, not long from now, the “House of the Pilgrim” which will be the model of a inspiring center which will unite all the conditions of this time and rescue the millennial traditions of diverse peoples of the world; of course the Andean traditions will be the “hosts” since we are in the Land of “Pachamama” and “Wiraqocha”. We are aware of a new rebirth of the Children of the Sun and the coming of the new age will show a path of light and love to the great race of humanity. “Inka Power Places” is an intriguing work that brings the esoteric and sacred Andean world into clear focus in the way that only one with a personal, profound and intimate experience of the subject matter can do. This book provides deep insight into the magical realities of the Inkan Children of the Sun. At the same time it provides insights into our very own nature. No matter what your background or purpose for reading, this book is sure to engage and fascinate not only your mind, but also your very Being. Mallku brings a unique perspective to this eloquent presentation of Peru’s sacred sites, temples and totemic spirits. Through the lens of his camera and his soul, and his deep understanding of the archaeo-astronomical relationships that govern cosmic initiatory rites of passage, Mallku brings to life the cosmology, history and magic of Peru. 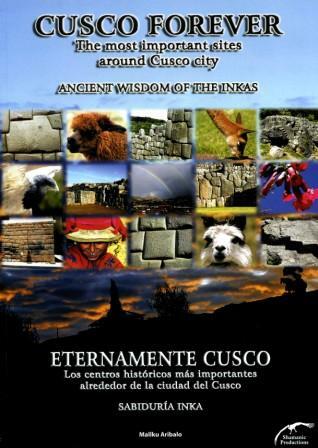 “Inka Power Places in the Andes” is a journey into the sacred of the Andean world, not only by the history and beauty of its temples, but also for everything that represents the larger dimension of Human Being Existence. Accompanying him on a trip guided by Mallku’s hands, eyes and heart is a privilege. More than all his knowledge about the Andean culture, he has the wisdom of drinking in the spiritual fountains of all the Power Centers in the Andes combined with the wise humility and determination of a warrior. I invite each of you, as readers, to dare to enter this wonderful journey in the Andean World travelling with a true spiritual guide who understands the Power Places in the Andes. Experiment and enjoy yourself on this journey. I heard about the work of the master Mallku, for the first time, in 1996, through a dear and special friend, the Reiki master Richardson da Silva Valle. 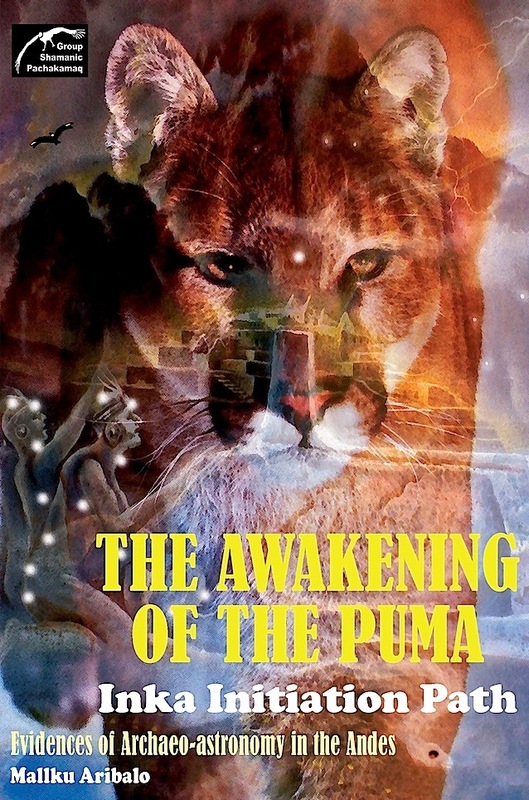 I read Mallku’s book “Inka Initiation Path, the Awakening of the Puma” and immediately I organized my trip to the Peruvian Andes where, during 10 wonderful days, participated of the dynamics commanding by the master Mallku. Years later I returned to the Andes and I was always enchanted by his company and guidance. I could feel that his work is stronger with the presence and help of his lovely wife Alanna Aisha. I recommend to all of you, the searchers of light, to study and experience the books and the works of this dedicated couple. Johnny De’ Carli – Author of seven books about Reiki Methods published in Madras – Brazil, Dinalivros – Portugal and EDAF – Spain. 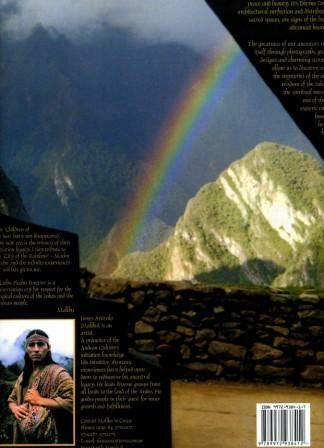 I travelled through a portal located in the verdant Sacred Valley of the Inkas during a near death experience and met an Angel that made me come alive again. I painted her and six others came to me with insights. They put me back in my body, chakra by chakra. I began to travel to Peru to explore the profound mystical depth of my experience, which eventually brought me face to face with the guide that would help me to weave the teachings of the Andes with the insights of the Seven Chakra Angels that arrived on my canvas. One evening I entered Cusco’s beautifully lit square for a farewell dinner with my friends, following a Full Moon Ceremony in Machu Picchu the night before. After suggesting that they go to dinner ahead of me, I left with a couple of others and went to a small shop. When we returned to the square, I realized that I had forgotten which restaurant I had agreed to meet them. I saw a man standing in the square and approached him hoping he might be able to help me. I began to explain my dilema: “Dónde está el restaurante por favor… Taren…Ti…Tani? He looked at me and simply asked, “Are you Diane?” I answered, “Yes.” We both felt equally stunned. He explained that he had travelled that morning from Machu Picchu to Cusco to find me and I had found him! This was the beginning of a timeless friendship born with a common respect for the land, the people, the mystery and the infinite love of Pachamama and Wiraqocha. Mallku walks between dimensions in the way of a true shaman, bringing the teachings of our ancestors, the messages of the Tenth Pachakuti, from the inter-dimensional world. I feel honored for opportunity to express my gratitude for his devotion and the inspiration he evokes in all those he invites to enter into the mysteries of illumination through initiations at the Sacred Sites of the Andes. Our experiences with him over the years have enriched and deepened our life journeys beyond measure. This book is, without question, of great significance, bringing to light a new paradigm of exploration allowing ancient knowledge to be absorbed not only by the linear mind but also by the whole being utilizing a range of meta-faculties encased within the human orb. This is done while retaining the deep heart-felt connection to the sacred earth, thereby maintaining a balanced perspective in observation and by bringing reality to the truth. 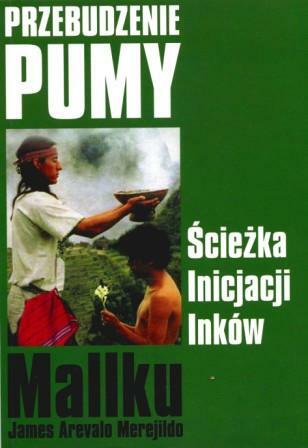 With “Inka Power Places” Mallku has removed some of the old belief systems pertaining to the Inka culture thus providing space to grasp and hold the advanced wisdom and power of the Andean Cultures and their sacred power sites. Furthermore it is my belief that Mallku is a revolutionist—they are always the first to bring through profound and often immediate change. They pave the way for what is, in retrospect, a return to truth, to the sacred knowledge not only of the cosmos but also to the reverence of the divine Pachamama. All of this is a vital element of our continued evolution. Thank you, Mallku, for a very fine work. The ancient peoples of the Andes created a mirror so initiates could connect with the cosmos. 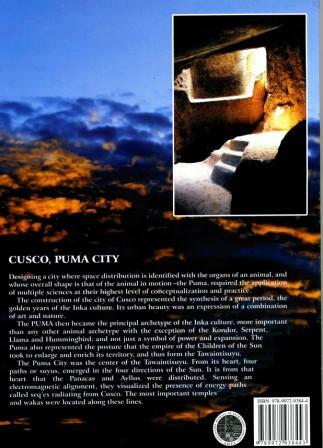 This information was encoded within the sacred sites and ceremonial centers in Peru. Mallku presents remarkable illuminations and astronomical revelations so that readers can interpret the visible from the invisible. This book is the key for the reader and traveller to unravel the mysteries of these phenomenal locations in the Sacred Land of the Inkas. Mallku, carries this ability to make changes, and so does this book that you are holding in your hands right now. He is an archaeo-astronomer, a scholar who is committed to putting the widespread pieces of ancient knowledge back together. By looking for the truth from the timeless past within the celestial order of things, he is heralding a new era. From another point of view, as a son of Peruvian Andeans and a descendant of the great pre-Inkas with a heroic past, he knows the land. In this book Mallku shows us a path, among the countless other paths, that can lead us back to the heart and open mind. He has revealed secrets of significant knowledge, opened our eyes and expanded our inner visions. He invites us to unite our Snake with the Sacred Puma. He is as the Kondor who takes the action of experience and passes on the knowledge. It is only up to us, how we let this knowledge fill us, recognizing the power and the beauty of Nature, by learning the way the Inka people saw this world and its magic. Mallku’s work takes us to the Universe of Beauty and Mysteries of the Andes, describing with the “Kondor’s Eyes” the cosmic vision of the Andean World. He describes the Power Places, the Inka palaces, its temples and cities, the Solar Festivals (Solstices and Equinoxes), the power of the Moon, the polarities, the power animals, and others. This is a book to read, before, during and after your journey to Peru. All of what Mallku describes in this book is the result of his intuitions and from what he lived, and can be experienced by the reader. It is a map and a guide for the sincere researcher of the chakras of the Earth and of his own centers of power. I travelled to the Andes to meet this Andean shaman and I returned surprised by the knowledge of this serious researcher. The Masters teach that: “one drop of experience is worth more than an ocean of words,” so I invite all of you to realize for yourselves the magic of Pachamama that the author describes in his book. Without any doubt the author’s knowledge and passion for this work is undisputed. 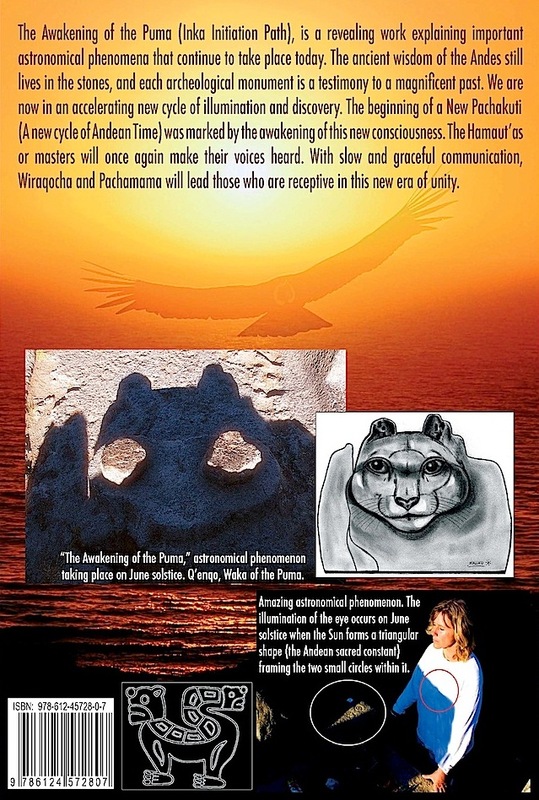 Not only does the content of this book make it a perfect, easy to read reference guide, it also brings together his shamanic knowledge, which is truly a gift from the Universe. 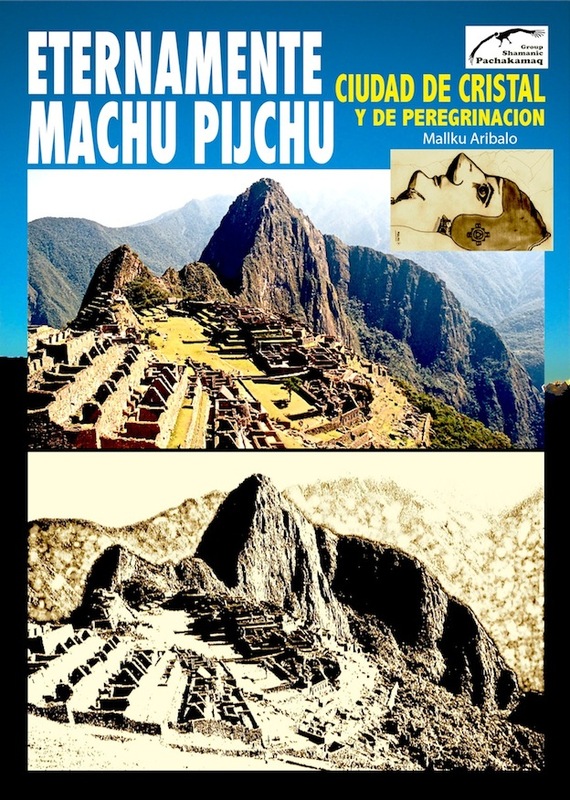 In my view it is a must read for all travellers to Peru, or to anyone who has an interest in its ancient sites, no matter how many times they may have visited this beautiful and mystical land. Mallku serves well in showing us the beautiful Andean examples of the geometry of solar alignment and thereby Solar Initiation. As we come to know more of the physics of spiritual growth in the electric fields that inhabit our high glands, the role of charge symmetry, optical triggering and the growth of the body spirit field or KA electrically—we come to understand the Science of the Solar Temples. Mallku’s work brings us to the threshold of deep understanding of Sun God – Wiraqocha. The Solar initiation is more than a personality worship, it inhabits the ecstatic moment – a perfected symmetry distribution of life and charge – the real divine – which is the real dream of all those seeking the meaning of sacred space. An exciting book, provocative, insightful and full of interest. Mallku continues to awaken our understanding of Andean cosmology and spirituality by illuminating the ancient myths and legends that continue to speak to us today. The book is inspiring, well researched, richly creative imagery and blends a range of disciplines making it a unique contribution to the Andean vision. 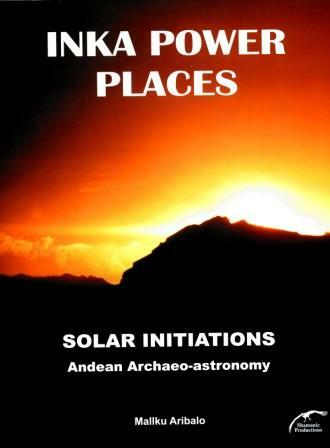 “Inca Power Places, Solar Initiations,” Mallku’s new book on the importance of the sacred sites in Peru is a necessary travel companion for any Spiritual traveller seeking to understand themselves through the wisdom of the ancients. Through his words and his insights Mallku manages to bring the important messages of his ancestors alive so that all of us can find our reflections in the messages they left behind, messages that are vital to help us understand our world. As he teaches us the interaction of the heavens with these power places, we may discover our own personal power. I find Mallku’s works to be as important to the true understanding of ancient Peru as John Anthony West’s endeavours have been unlocking the ancient codes hidden in Egypt. Nancy Joy Hefron – Tour leader, emotional healer and author. 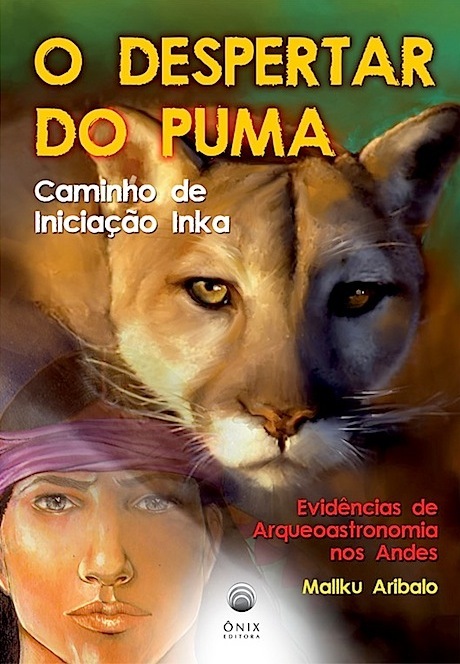 “Inka Power Places in the Andes” is one of the books that we should read with a wider perspective, similar to the moments in life in which we watch an event, but we see beyond the things and objects. 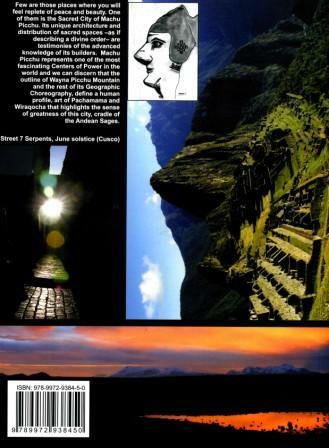 The author is a researcher of the Andean cosmic vision. On his journey in the Andean mountains, he always looked for the ancestral knowledge and went to the Wakas (Power Places) where he knew was the real Being’s Science. He learned “to see” with his heart and body, the wonderful things that our ancestors left to us. I had the honor of enjoying some of the Power Places that are unknown to the human knowledge and described in this book. Sometimes we have abstract experiences, maybe because we involve totally our brain, our body and our soul and not just the fraction of one part that we use while we are thinking, it is something that goes beyond faith, is a magical journey. Mallku dedicated a large part of his life doing hard and profound research of what has been the object of the biggest quest of the human condition: to understand and to live within the mystery and beauty of the world of the ancient ones. It has been a long time that human beings have accepted the knowledge of a supposed evolution, marked for the religious interests and for dogmatic values. 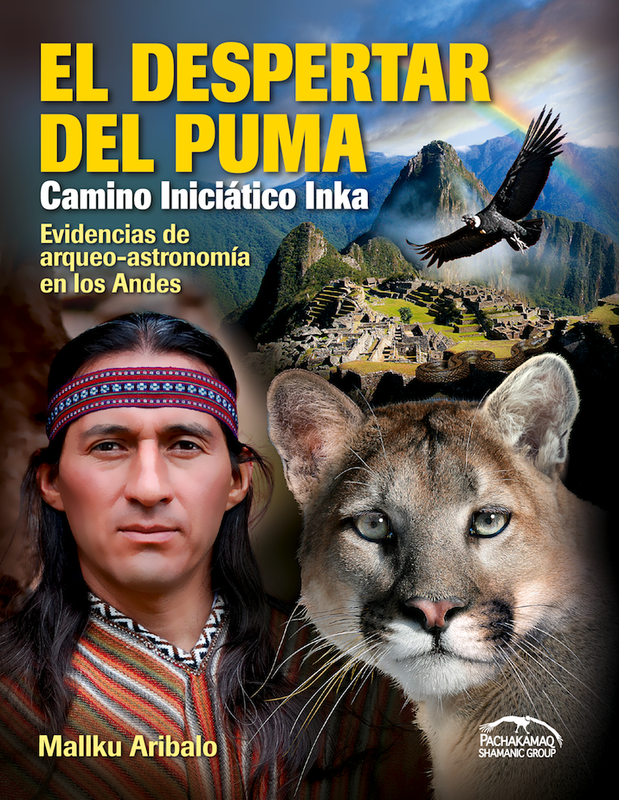 Through the content of this book you will have a higher vision of the evolution of the Andean culture in which the author gives clear signs to the searchers of the truth. Mallku brings outstanding discoveries, brilliant insight to human needs, higher understanding of sexuality in deep perspective. Teaches us much about what is really important in life, makes us realize that humans are humans where ever they live. As the saying of the old Greek philosopher: “The more we know the more we understand that we don’t know.” A new science is born in this book. I’m surprised with Mallku’s new book, it is fantastic! Mallku is a soldier of light, having the necessary wisdom to transmit the spiritual, cosmic vision of his ancestors rooted in the wisdom of the ancient knowledge of the Andes. He knows the safe path, grounded and free. He knows the shamanic way very well and is a natural discoverer of the footprints of time and the treasures that still survive through the mysteries of the ancient ones. I congratulate Mallku from my heart and wish that Pachakamaq will continue giving him light to share with the ones who are searching for it. My recommendation for those who are having a journey through this book, is to do so with the eyes of the heart, as the energy you encounter there is bound to take you directly to the center of your Soul. I feel that the Andean Power Places are the richest centers of “Pachamama” throughout the world where the aware humanity and mother earth dissolve into the Great Cosmic Unity. To connect with the ancient wisdom, which is available to human being, is a moment of higher consciousness and deep understanding that these centers also exist within our Soul and therefore we are able to breathe in harmony with the Soul of Mother Earth. I am deeply thankful for the existence of Mallku by sharing this beautiful expression of love that helps us connect harmoniously with our ancestors travelling beyond time and space, and regaining love and respect for nature as we learn from the signs she has given to us. As we upgrade consciousness we learn to use all our intelligence and understanding; we are part of something beyond what we believe we are, discovering the divine existence inside ourselves. To go deeper into the history and to respect the knowledge and richness of ancient civilizations that lived in unity with the Universe touches my heart and invites me to bow in reverence to its greatness.